“The Seven-Son Flower”(SSF) has to be one of my top 5 trees for the residential landscape. I grade very harshly on the best because the need to have either 4 season interest, or another characteristic so powerful . . . the tree becomes a must have in the designed landscape. A small tree only 15′-20′ high in Zone 5 and maybe a 10′-12′ foot spread means H. miconiodes will have a small footprint on the typical suburban landscape. Great cranky branching, long leaf open habit with just a little pruning sets this tree off and we haven’t even got to the best part and there are many best parts. 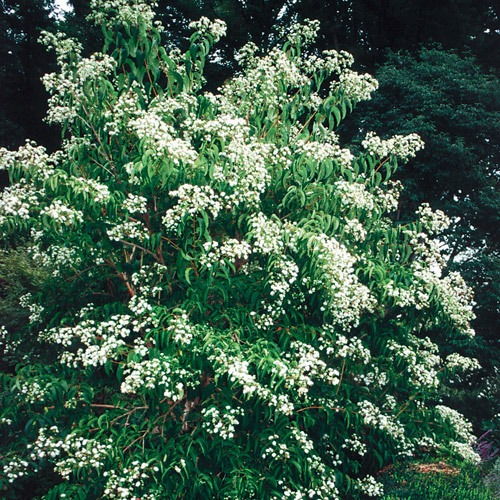 Clusters of fragrant white flowers appear ‘late summer’ they’re beautiful and they last for several weeks. The smell is great and when you can site the tree to take advantage of this fragrance all the better. Hardy from USDA zones 5 through 8, Heptacodium is native to eastern China (Zhejiang Province) where it is rare. In fact, all the plants currently in cultivation in the U.S. are from a single plant in the Hangzhou Botanical Garden, the seed being first introduced in 1980. H. miconioides was introduced to North America by the Arnold Arboretum immediately following the 1980 Sino-American Botanical Expedition to Hubei Province. As I understand it there are now more SSF growing in the U.S. than anywhere else in the World, this includes China. In my reading I got the idea that this tree no longer occurs naturally in China. . . what a shame, and to top it off when talking about this great tree . . . I’m willing to bet the average Landscape Contractor could not identify SSF. In the fall another spectacular display the rosey red calyces replace those white flowers. These calyces remain most of the fall putting on another good show. here’s a tip for you-if, if you can get some late day back lighting the red calyces put on a great show. It’s the calyces and not a change of leaf color that make the fall show and; of course, the bark which carries on throughout the winter. Did I mention there were no known diseases or pest . . . I hadn’t? Well I am now. 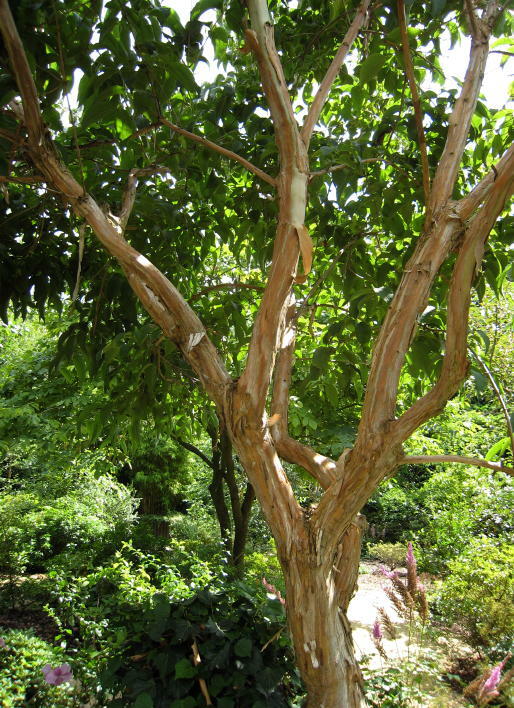 I was personally introduced to this tree by the late-great plantsman Dr. J. C. Raulston from the North Carolina State Arboretum. Dr. Daulston was my favorite to go hear lecture. In an hour he would flash slides of 90 different species that the audience had little or no knowledge of and he would just rattle off the information-never saw him with any notes-ever. If you are/were into this type of thing it was mind-boggling and inspiring at the same time. If you have stayed with me this long I have 2 links to pages you might enjoy. 1st; Urban Trees for use under Utility Lines, it’s a great resource document for any designer. 2nd; is a Arboretum newsletter for the J.C.Raulston Arboretum home at NC State. It’s about fall color. Finally the are going to have to store some of those seeds for posterity, Ice Ages, Global Warming, etc. Well they got the place to make it happen-someday soon. Finally, finally . . . are you trying to figure out a way to store and organize all those great pages from the net I keep sending you to, including HTML and images, links, etc.? Say no more . . . I have a suggestion. I use the free version of Evernote and am very happy about that. Acknowledgments to the Missouri Botanical Garden and Arrowood Nursery for most of the images. Rick, I can see why you love this tree. What an amazing specimen. How much would one of these trees cost and do you find them hard to get hold of? Stuart; I do not know what your retail market is like, you need to call around your area to good Garden Centers, if they do not have it, they will be able to get it-or they’re not very good!! Price wise, my best local wholesaler charges $90.00 for a 7.0ft B&B in clump form, another example: 1.5inch caliper in a #10 container is $80.00 bucks. I would think you’d double that for a retail price to give you an idea. Okay folks another shout out for SSF, as for Oxydendron, we might be better off buying 6 or 7 half-inch caliper whips, planting those and seeing what hangs in there. It’s a damn fine tree, I’ll bring it up on a post here soon, seeing’s how the weather isn’t going to break for awhile. I am glad to read this! I just purchased three of these from Bluestone!! Why thank you Sissy, i will try and continue to psot some worthwhile stuff, and while I’m doing that I’m also sure I will post some stuff that is absolutely useless. But I gotta say I am having a blast. Tell all your friends to drop in. You will love the tree, it needs to be used so much more. So, how much shade can these take, and still bloom? I recently picked up 2 in the ‘dead plant section’ of my local nursery; a worker there gave them to me for a song because I was the first person who had been able to identify them during the months they sat in the nursery. I’d been lusting after them for years, but the only spot I had that would really accommodate them when they’re full grown is in a fairly shady area. They’re doing well after a month or so in the ground, and flowering, but I would not like to think this year’s will be the only flowers I’ll see. They get about 4 hours of morning sun; I’ll move them if necessary, or cut down more of the blasted norway maples that are shading them. Nan . . . Wilber & King Nurseries in Guilford, Connecticut has a shaded area in back of the property where they purposefully place plants in less sun than is recommended. In that area, on the east side of their barn is a 6 year old heptacodium I would estimate is nearly 25 feet tall. Beautiful tree. The gardner told me she had planned on a shrub like heptacodium but an assistant did her a “favor” and heavily pruned it. Looks good as it is to me with three main trunks. She also said she was pleased at how rapidly it grew and, while she doesn’t know for sure, she credits the fast growth to the nearly always moist soil in that area. Moist, and damp but not always wet . . . makes sense that it would do so well there. I love, love, love this tree. It is a great choice that adapts to many things a home owner may throw at it. Neglect, over-watering, wrong placement…. and it still seems to shine! Was reading about your love of the “seven son tree” and will seek out a place to find one. Am very interesetd in finding out what your four other favorite trees are. I have three more holes to fill and would love some advice for the family located in zone 5 (south east Michigan). Thanks again for the help and most certainly the thoughts on the seven son tree. Keep reading the blog, I’m sure that list will appear sooner than later. I just purchased a heptacodium miconiodes at Sunnybrook Farms Nursery on Route 306, just East of Cleveland, OH. It’s five feet tall and gorgeous. They have at least one other one on the lot. Thank you for the information on the Seven Sons. I bought it at Tyler Arboreaum on the recommention of a volunteer on the plant sale day. Unfortunatly I bought it as a shrub and planted it kind of close to my house. It hasn’t wowed me so far but I am patient! It has been in the ground for two years. Should I move it to a more open spot? I live in a twin house and have only about 1/2 day of sun in most areas. Lots of big trees – love the shade but it can limit what I can plant! This is the first information of any kind I have found and it sounds like a tree/shrub that I would like to keep around! It would help if I knew what zone you are in. Other than that the more sun the better, I would fertilize with a 20-20-20 mix and also add a super phosphate mix like a 0-40-0 for flower bloom. Give it some time, it is a awesome small tree! i’d like to purchase the seeds for Heptacodium(seven son flower). if it’s possible, i want to buy more than 10 pounds for the seeds. please let me know where i can buy the seeds. I have this tree but it’s in a corner and is a too shady spot. When can it be moved? And is it possible to grow in a large pot? Next PostNext So . . . Who’s Happy Today?